Welcome to Tiger Moth PL ! My name is Jacek Mainka, 41, Warszawa, Poland. My late grandfather, Ryszard Kwiatkowski, was a fitter in RAF / Polish Air Force 1940-47 (303 and 308 Squadrons). That's why and where my interest started. All the pictures you see above are his badges, his documents, books signed by his friends for me or pictures from his albums. I graduated from Warsaw Institute of Technology, Aeronautical Department and joined Polish Airlines in 1997. I work currently as A320 TRI in Wizzair. In 2007 I decided that the time has come to fulfill the very, very old dream – to finally fly a ex-RAF ex-PAF airplane to Poland. With great help of Stuart McKay, Mike Vaisey, Joe Wright, Scott Butler, John Dodd, Charlie Brown and many others I bought, learn to operate and finally flew DH82A Tiger Moth ex-Booker G-AFVE to Poland. It is the first ex-RAF WWII aircraft to arrive and to operate in Poland. Yes, no Polish Air Force airplane, with a Polish pilot, was allowed to fly back to brave Polish "Few" to their home country. I wanted to show that this time has come to the end, it is all normal now. The veterans in Poland, their children and grandchildren like myself - all can enjoy the sign of those old airplanes. After coming to Poland with those historic airplanes I flew with number of ex-PAF pilots – Ms.Jadwiga Piłudska (ATA), Mr.Jerzy Główczewski (308Sq), late Mr.Antoni Tomiczek (301Sq) and others. Also took part in 70th Anniversary of Battle of Britain flypast over residency of HMA in Warsaw and 68th Anniversary of Battle of Monte Cassino over Military Museum, Warsaw. Surely visited a number of airfields around the country, done trips to Germany and France. One Polish DH82A flew once around back in 1934-39, VE is the second. I am member of The Moth Club and try to visit UK as often as possible. I have now also UK CAA DA. DAE was Charlie Brown in person. A small collection started when Tiger Moth was joined by 1944 Taylorcraft Auster IV MT255 three years ago. Ex-663 Sq AOP Austers' pilot, Jan Paśnicki, waited at the airfield in Konstancin to meet MT255 that day. So that's the story of RAF/PAF fleet growing a bit and going up and down UK - Poland. I am really happy that I can take part in the re-creation of the UK-PL history from the best time. Those airplanes allowed me to meet wonderful people – my British friends. In fact not only British. I go to Germany to meet my Quax friends and also recently - very nice contacts in Bremgarten! Nationalities I flew with on T-7230 or MT255? Argentina, Canada, Germany, Hungary, Finland, France, Sweden, Switzerland, UK surely, USA. I spent a fantastic weekend in Lens, France in 2012. Hope it will all continue! G-AFVE went to UK for a maintenance in late 2012, she is back in Poland now. Auster is based near Warsaw at the moment however a trip to UK planned in 2014. 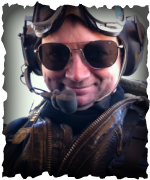 Last October 2013 I flew a Spitfire XVI solo for the first time ever. The airplane is very symbolic for so many. I have a dream to fly this type to Poland as well. This is a British icon however it's worth to remember that about 1500 Spitfires were used by Polish Air Force. The most popular PAF airplane ever - now, in the past and in the future. Since than I added some time in Spitfires XVI and IXT. In March 2014 I flew Spitfire TE184 on Germany - France - UK reposition. The view: White Cliffs of Dover and Spitfire wing - I could not believe my luck! Summer 2014 was "Spitfire Summer" in Poland. I came with TE184 to Dęblin via Rudniki. A flight with "Orliki" Polish Air Force aerobatic team was organized. ZF-U markings of Jerzy Główczewski airplane he flew with in 308 Sq in 1944/45 was put on. Jerzy sat in "his" Spitfire in Dęblin and Kraków - as he should do almost 70 years ago. Mission accomplished! Other air shows and meetings were attended to. My "poor man Spitfire" - DHC-1 Chipmunk - was finally test flown in Wickenby and I flew her to new home in Poland in July. And finally Auster MT255 changed country of registration to Poland as SP-YHU "special" category airplane. Still - the goal for Auster ops is to keep the contact as close as possible with UK pilots & engineers.